Being local to Fort Collins, we understand the importance of keeping business local and we, both individually and as a business, try to do as much business locally as possible. Besides reducing transportation costs and being more sustainable, keeping business local has huge economic and other benefits. For example, money spent at local business is typically put right back into the local community whereas money spent at large corporations and franchises is oftentimes shipped back to their corporate headquarters. Keeping money local is extremely important so the "money multiplier effect" can reach its full potential. 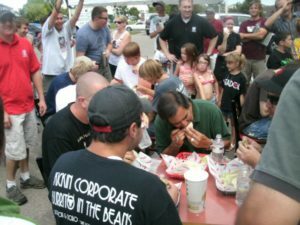 For example, if a customer spends $1.00 at Matador Mexican Grill, Matador then spends this money locally with local advertisers, vendors, employees, etc. where in turn, these local advertisers, vendors, employees, etc. spend the same dollar locally creating a "multiplier" effect where everyone in our local Fort Collins community benefits (more jobs are created, more money is available for better schools, roads, parks etc., the list goes on and on). However, large corporations and franchises take this same dollar and send it back to their corporate headquarters completely destroying the money multiplier effect in our community. Numerous economic studies have been performed validating the importance of spending money with independent & locally owned business. 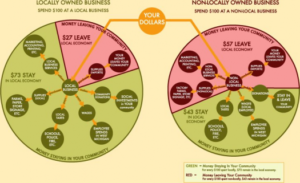 One study talked about by Kelsey Keith in a Fast Company article shows $0.73 out of every $1.00 spent at a local business stays in the local ecomony whereas only $0.43 out of every $1.00 spent at non-locally owned businesses stays local (see the graph at the left). Likewise, hometownadvantage.org compiled a list of studies showing how important it is to buy local. highly encourage you to choose a local business. Together we thrive! Matador Mexican Restaurant is an independent, local family owned restaurant chain in Northern Colorado with locations in Fort Collins and Loveland. Matador is owned by Paul and his wife Jaclyn and Brad and his wife Elizabeth. Both Jaclyn and Elizabeth, sisters, are true Ft. Collins natives. Both were born in Poudre Hospital in Fort Collins (and all of their kids were also born there!) and Brad, Elizabeth, Paul and Jaclyn all attended Colorado State University. Paul and Jaclyn were married in Fort Collins in July of 2000 and Brad and Elizabeth were married one month later in August of 2000, also in Fort Collins. Brad & Elizabeth have three kids and Paul & Jaclyn have four kids. Besides Paul, Jaclyn, Brad and Elizabeth, 20+ other of their immediate family members live in Fort Collins. In total, their family is made up of more than 30 people, all living and working in the Fort Collins and Loveland community. Spend it here, keep it here. Together we thrive! We are know for huge burritos, awesome smothered burritos and our vast variety of homemade sauces! Multiple other businesses resell our sauces including New Belguim Brewery. We have you covered from our mild sauces made from beer provided by local breweries to our wicked hot sauce made from the hottest peppers on earth. You want hot, we'll make you cry!